As we approach the end of the year, I want to report to you what MBCN has accomplished in 2013– with your help and support. We created a new logo this year to better reflect our mission—educating, empowering and advocating. • Our 7th annual national metastatic breast cancer conference in cooperation with experts at MD Anderson in Houston, Texas. Over 225 patients and caregivers attended the September 20-22 event. All the presentations were recorded and are on our website. • MBCN partnered with Living Beyond Breast Cancer to develop and write an expanded booklet called, “Guide for the Newly Diagnosed Patient.” It can be ordered for free or downloaded on our website. 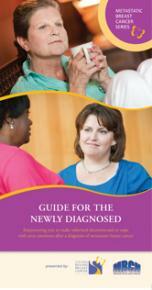 We urge members to take copies to their oncologist’s office so patients can benefit from it. •MBCN expanded the amount and kind of information on our website (mbcn.org). There patients can find our national conferences’ recordings; info about clinical trials, pain and supportive services; financial resources, inspirational stories from those living with our disease; and advocacy strategies. •Our new T-Shirt was popular and part of our October 13 MBC Awareness Day campaign. •Our short videos were also well received, especially during October. How do you LIVE with metastatic breast cancer? •Each day in October we posted a Fact a Day on Facebook for you to share with friends and spread education and awareness of living with metastatic disease. See the 31 Days of October. • At the San Antonio Breast Cancer Symposium (SABCS), MBCN was part of a panel that explained clinical trials to other patient advocates and the challenges facing metastatic patients to decide and participate in clinical trials. •MBCN partnered with Novartis to develop and edit an online magazine for caregivers of metastatic breast cancer patients. 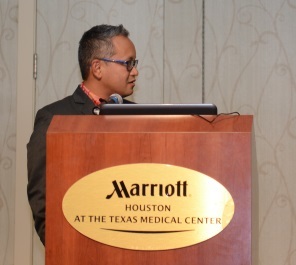 •At our annual conference, a special session on how to advocate on behalf of the metastatic community was developed and presented to attendees. An “Advocacy Kit,” complete with instructions and tools, is on our website for any patient, family member or supporter to use. •MBCN has guided, informed and empowered several patients and/or their supporters who want to host an educational and/or fundraising event in their community or local hospital. See our fundraising section on the website. MBCN provides free materials for these events. •MBCN encouraged its members to participate in quality surveys that sought to identify challenges and concerns of patients. • Based on a vision by MBCN, the Metastatic Breast Cancer Alliance was formally announced to the public this year during our Metastatic Breast Cancer Awareness Day campaign. The MBC Alliance consists of 16 breast cancer organizations who have joined together, driven by a vision to transform and improve the lives of women and men living with metastatic breast cancer. See my remarks at our first face-to-face meeting. •MBCN has a seat on the Board of Directors of the National Breast Cancer Coalition. We advocate on behalf of Breast Cancer Deadline 2020 to find the causes of metastasis and participate in strategic planning and implementation of that goal. •MBCN served on the Global Advocate Planning Committee to organize and plan sessions for global advocates at the Advanced Breast Cancer 2 Global Conference in Lisbon where doctors discuss and decide on treatment guidelines for the disease. The advocates discussed common global challenges facing patients with metastatic disease. MBCN reported on the findings of a US survey of metastatic breast cancer patients that asked patients about quality of life issues. Those are the highlights of 2013 and we are planning an ambitious year for 2014! If you have questions for us, or ideas you want to share, please leave your comments below or contact me directly at s.mertz@mbcn.org. Metastatic Breast Cancer News from San Antonio: Stay Tuned. You are currently browsing the MBCNbuzz blog archives for December, 2013.